Waaaa, two posts within the same week! Unheard of. I’m sure I’ll disappear for like six months now. Man I have been wanting to use this horns/mask combo from The Plastik forever because they remind me of Warcraft’s Demon Hunters. So this is my Demon Hunter goes glam on her day off look. And I had to work in the newest tattoo from ~silentsparrow~ because I imagine if my DH had her druthers she’d prefer her tattoos to come courtesy of hyasynth as well. Today’s look came courtesy of trying to make my brain take a break from trying to drown me in fear and anxiety. 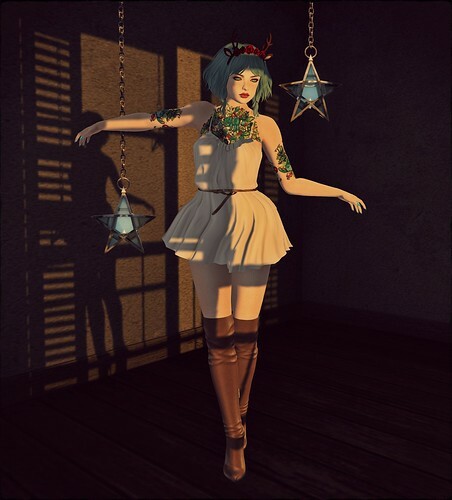 SL has always been a great place to escape for a while and play some serious dress up thanks to the amazingly beautiful, wondrous things being created by incredibly talented people. Hey, another extended absence! Things have been not great. My last surviving precious dog passed away in early November. To say I took his loss hard would be an understatement. I shut down and spiraled into a pretty nasty bit of depression. When I finally surfaced, I decided it was time to move on and get myself another dog. Unfortunately, my new little addition has had one health problem after another. The poor thing hasn’t had a normal day since she came to us. I love the little booger but wow it’s been rough dealing with a sick dog on the heels of losing my last dog. Of course, when it rain it pours, and I’ve been sick myself for over two months. Add in a sprinkle of crippling anxiety and insomnia and you have the last few months around Casa Fricka. Anyways, my apologies for vomiting up my RL onto you, gentle reader. Shall we get to real reason you are here.. SL and shopping. As always, nothing gets me into SL like new tattoos from hyasynth of ~silentsparrow~. Her illustrations just make me happy. 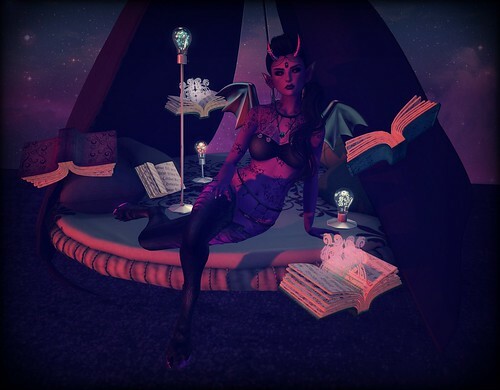 So have a look built around her offering for today’s Fifty Linden Friday.